A back to the origins. Vaselli kitchen, bathrooms, living exhibited in the Listone Giordano Arena, Via Santa Cecilia 6, from Tuesday 9th to Sunday 14th April. Sedimenti – the Italian word for sediments, from which stone originates. Layers appearing in the cuts in the Travertine, which relentlessly mark the passage of time; the evolution of sedimentation, lines which are then transformed into arabesques. Vaselli wants to be the final sediment, the final layer; the human hand that shapes the stone without altering its original path. An attempt to lead the layers to their next natural stage, by transforming the stone into elements that enhance its purity. For over a hundred years, Vaselli has been renewing the ancient tradition of working natural stone extracted from the Tuscan marble and travertine quarries. Our family passion, together with avant-garde processing techniques, enables our company to start from the material and produce unique, one-off, tailor-made products. Vaselli creations use the essence of stone combined with materials, such as wood and iron. We design and produce every individual part by hand within the brand’s craft workshops, to suit the individual client’s requirements. Our authentic products are made according to a single standard to give an exclusive result. We owe our success to the close attention par excellence we pay not only to the processing of the materials, but also to our customers, their expectations and wishes. Our contacts are direct and personal, so the customer can select, and actually touch the block of stone from the quarry, from which we will be making their kitchen, bathroom or furnishings in the living room. 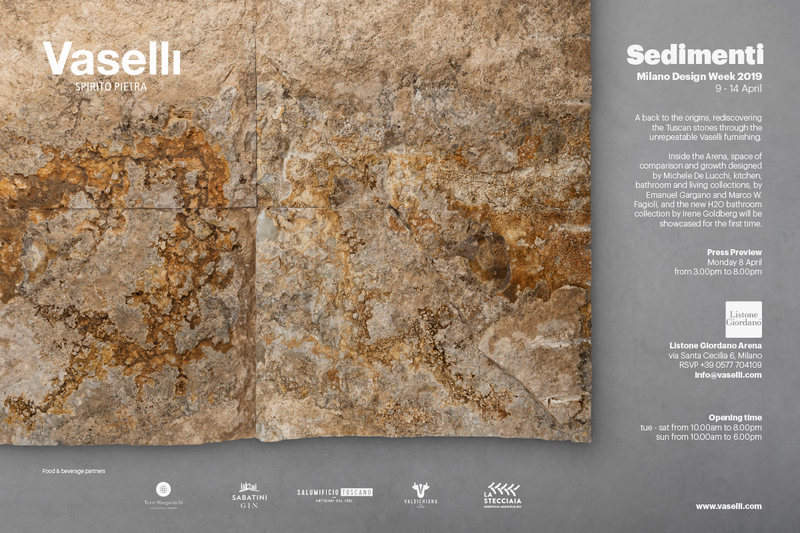 During Milano Design Week 2019, Vaselli will be revealing its own origins and those of the Travertine it has used to construct its foundations and, together with other noble Tuscan stones, to turn it into unique furnishings. This will be held at the Listone Giordano Arena in Via Santa Cecilia 6, a space in which to compare and develop, designed by the architect Michele De Lucchi. On display from the line of kitchens, OCO, the supreme expression of the Vaselli bond between technology and tradition, was designed by Emanuel Gargano and Marco W. Fagioli. This kitchen island is made of Travertine Noce from Rapolano. Its panels show the easily recognisable stratification of time, right up to the functional, solid worktop to reconstruct the entire block of stone encasing the noble structure in Noce Canaletto. The solid blocks of Tuscan stone are again used by designers Emanuel Gargano and Marco W. Fagioli for other bathroom and living room furniture. A totemic washbasin made of Breccia Capraia, an ancient Medici stone, is followed by yet another piece in stone from Rapolano, the Sole bookcase with rough Travertine uprights and the organic Cora bench in Travertine Bianco Rapolano. Milano Design Week 2019 will be the backdrop to a preview of H2O, a new, elegant bathroom collection, inspired by the idea of research and innovation behind a scientific laboratory, in which stone and metal blend happily together. Following the success of its outdoor kitchen Chrysalis, our collaboration with Irene Goldberg, designer of the collection, continues. Her most iconic item, the Arabesque marble and metal bathroom unit is a clear reminder of the laboratory bench and will be showcased at the Listone Giordano Arena. 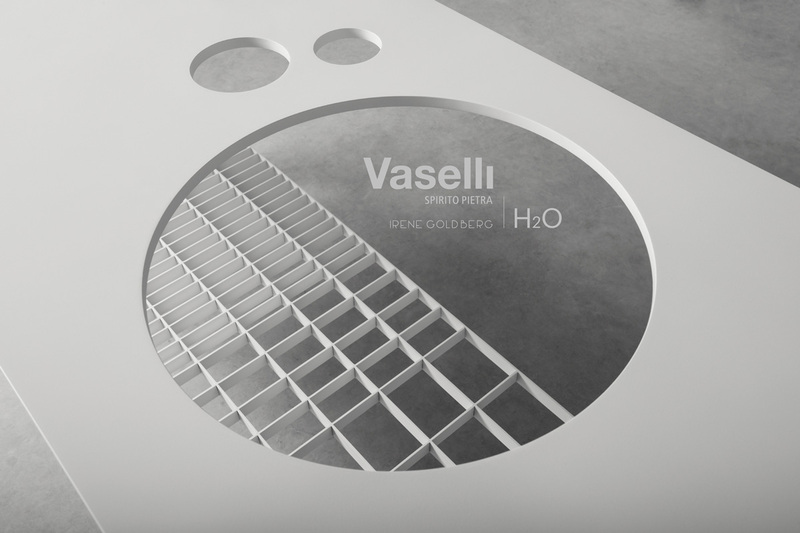 Vaselli completes a process begun many cycles ago, by subjecting those sediments which created the material it all began with to one final transformation. In the meanwhile, arrange your appointmet to meet us at the Milano Design Week 2019!